I'm not a huge fan of fast food. It obviously isn't the healthiest, and it isn't necessarily the best deal. If you're in a hurry though, sometimes it's not a bad option. When forced to eat a fast food breakfast at McDonald's (often at an airport), I usually go with the Egg McMuffin. At only 300 calories, it's one of the better choices. It has a nice mix of carbs and protein that also keep me feeling satisfied. 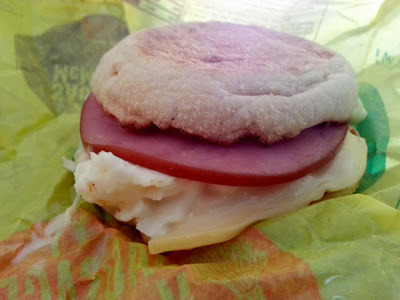 When I heard about the Egg White Delight McMuffin, I knew I'd have to try it. On the McDonald's website, the Egg White Delight McMuffin is described as "freshly grilled egg whites, extra lean Canadian bacon and smooth white cheddar, stacked on a toasted English muffin made with eight grams of whole grain. Great taste for 250 calories." You had me at "white cheddar." Ever since visiting Vermont last year and enjoying a bowl of White Cheddar Soup, I've been hooked. I also like egg whites better than full eggs, so this breakfast was made for me. It doesn't hurt that it's only 250 calories. If you have to grab a quick breakfast, the Egg White Delight McMuffin certainly satisfies and could easily fit into a healthy diet. I definitely wouldn't recommend eating fast food everyday, but when circumstances require it, there's no need to feel guilty about this breakfast. Good job, McDonald's. My only complaint? The "meal" comes with hash browns, which is not a healthy option. It should come with apple slices or a fruit cup. Unless that happens, I wouldn't recommend ordering the "meal."